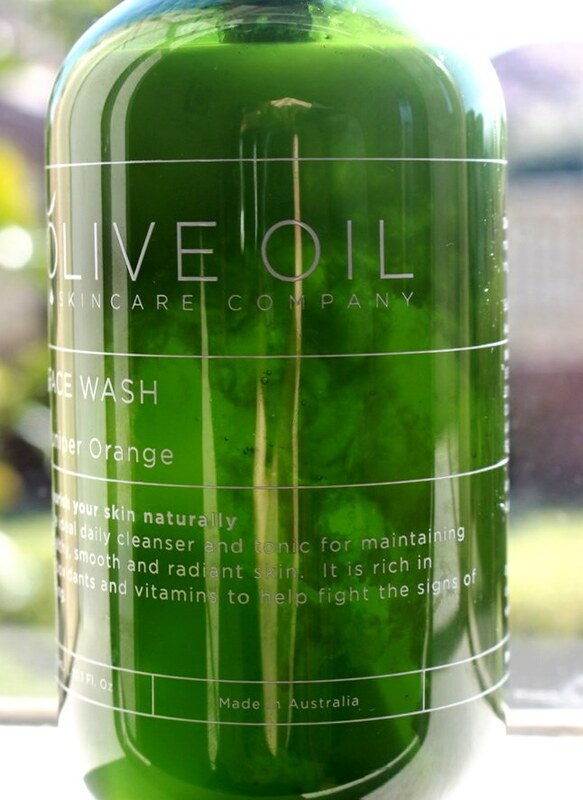 The Olive Oil Skincare Company Juniper Orange Face Wash claims to be the ideal daily cleanser and tonic for maintaining healthy, smooth and radiant skin. Rich in antioxidants and vitamins it helps to fight the signs of ageing and benefit problem skin conditions. The Juniper Orange Face Wash comprises 100% natural ingredients, a total of 14, without SLS (sodium lauryl sulfate), parabens, palm oil, artificial fragrance or colours. 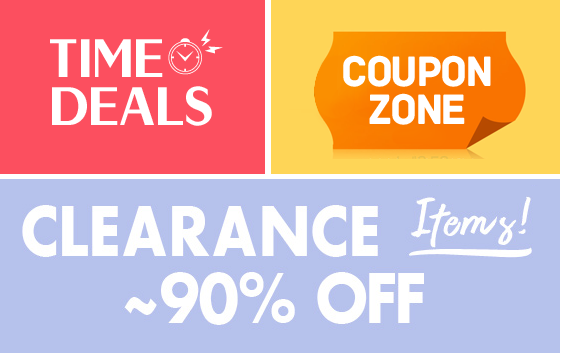 This indicates a favourable product in terms of composition. An investigation into the individual components will allow us to see if it is an effective, non-irritating cleanser. The face wash comprises a series of all-natural surfactants, moisturisers, purifiers and preservatives. Surfactants provide the product’s foam and lather. Additionally, they lower the surface tension between water and oil, encouraging seemingly immiscible substances to bond. As such, they cling to dirt and oils, allowing them to be gently lifted and washed away. Water is represented at the highest concentration in the formulation followed by Decyl Glucoside, a derivative of coconut and glucose (corn starch). Sodium Cocoyl Isethionate, Cocamidopropyl Betaine and Coco Glucoside are also derived from coconut, more specifically, coconut oil. 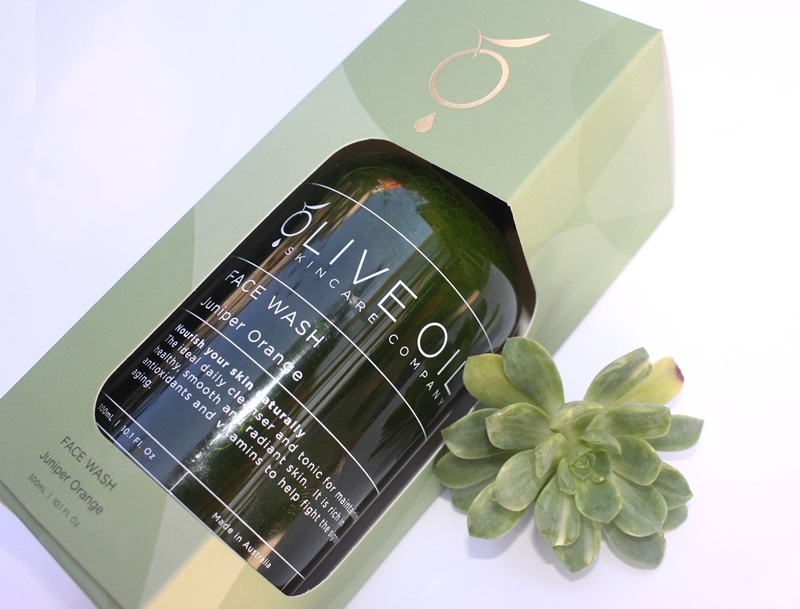 All are gentle surfactants which help to deliver the actual cleansing properties of the wash.
Olive Oil is a brilliant moisturiser and softener, able to penetrate deep into the skin to provide hydration and conditioning without blocking pores. It is also a source of antioxidants, Vitamins A and E neutralising free radicals that damage collagen and cause skin dryness and wrinkles. 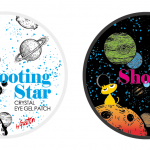 It is of course, the star brand ingredient and is responsible for retaining and even enhancing skin moisture. The Juniper is a coniferous evergreen shrub. Juniper Berry Oil displays antiseptic properties which can relieve a wide range of skin problems such as eczema, acne and psoriasis whilst astringent characteristics help to remove oils and dirt from pores. 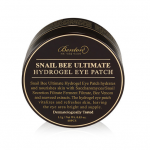 It is therefore included to heal problem skin and assist with pore cleansing. Bitter Orange Oil contributes a freshening effect and cleansing capabilities without stripping. 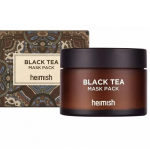 It ensures skin feels refreshed, balanced and moisturised after cleansing. Citrus oils can however increase UV sensitivity, although this is unlikely with a wash off cleanser. 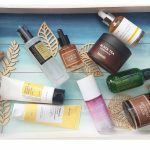 The formula certainly supports the product claims, a short ingredient list displaying all the characteristics necessary to fulfil them. 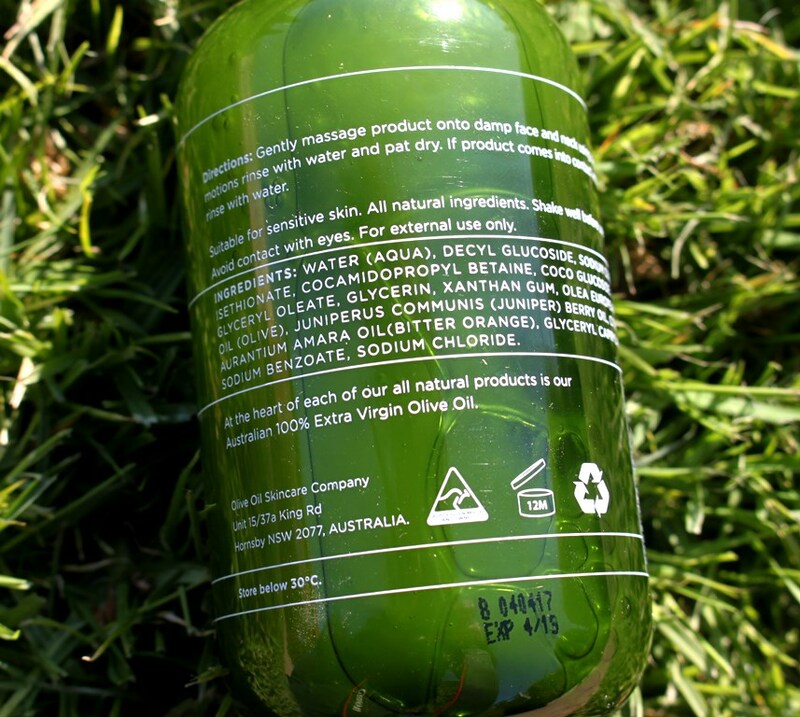 The cleanser comes in a plastic transparent green tinted, pump action bottle. 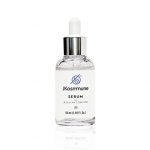 As it is made of 100% natural and gentle ingredients, it is not surprising that the CosDNA analysis is favourable. With an impressive score of 1/10, the EWG Cosmetics Database confirms product safety. 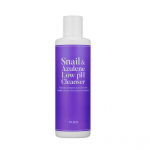 Gently massage product onto damp face and neck using circular motions, rinse thoroughly with water and pat dry. As its name would suggest, this face wash has an orange scent. 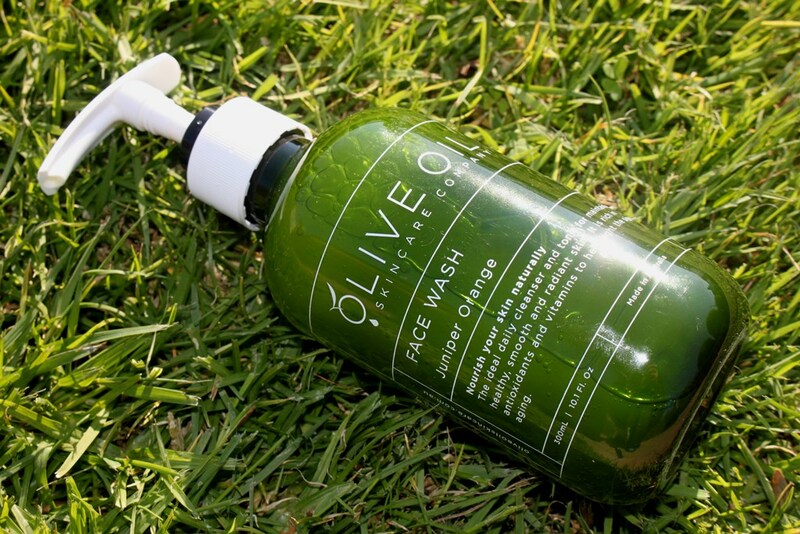 The Olive Oil Skincare Company Juniper Orange Face Wash comes in a 300ml pump pack and sells for AUD$19.99. 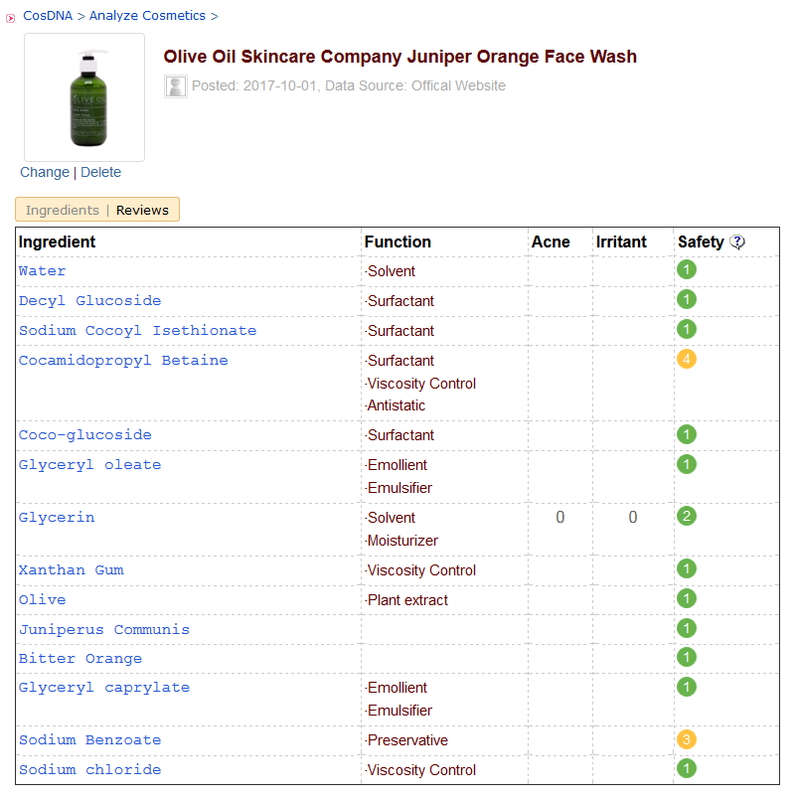 The Juniper Orange Face Wash is available from the Olive Oil Skincare Company website and also from Priceline pharmacies. 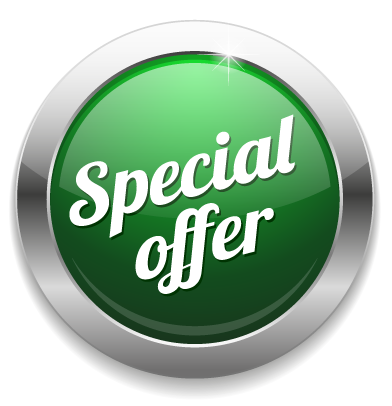 The product expires within 12 months of opening and has a shelf life of two years. 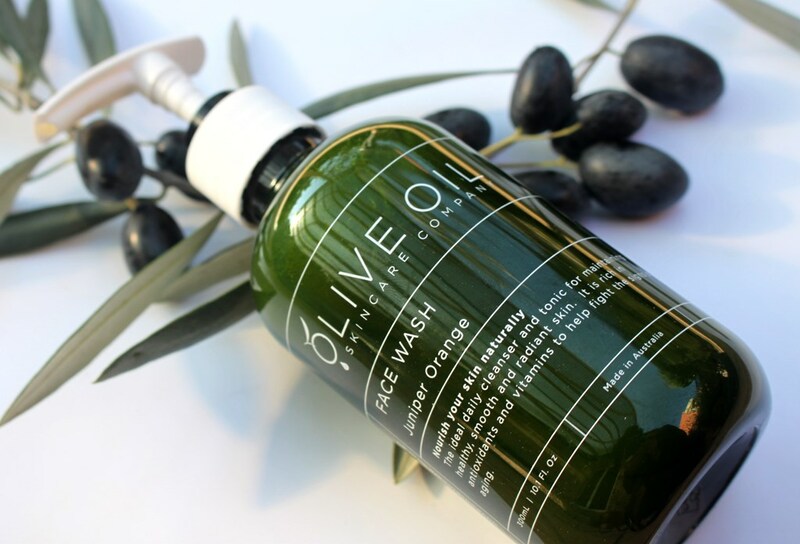 Generously packaged in a 300ml pump action bottle, the Olive Oil Skincare Company Juniper Orange Face Wash is well priced considering both the quantity and the quality of the all natural formulation. The wash comes out near clear, slightly cloudy. The consistency is a little runny for a foaming cleanser. You have to rub it between your palms and then apply it to your face to stop it escaping. One full pump will cover both the face and neck. The formula displays some level of separation when sitting idle, as shown in the image below. (I do find this rather intoxicating to look at!) Directions advise shaking before dispensing to unify it. I can only guess that this is due to different ingredient densities and separation of olive, juniper berry, coconut and orange oils from the other ingredients. Given the mechanics of the packaging and dispensing, you would think that mixing would have little effect on the product already drawn into the tube waiting to be pumped out. So is this the best presentation for this product? Perhaps an airless pump would be more suitable. It would permit all parts of the solution to evenly mix upon shaking. Regardless, it doesn’t seem to effect its performance. I have been using this for a couple of months as a start to my morning routine and a second cleanse in the evening. 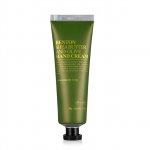 I wet my face and then gently massage the cleanser with my fingers to create a light yet satisfying lather without foam. The product feels very gentle on my skin and washes off just as easily without any hint of residue. 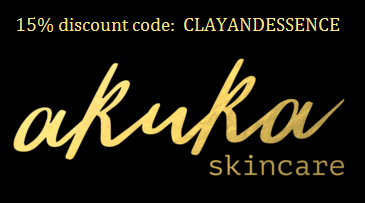 After patting my face dry, it feels plump, clean and fresh, free of tightness or any form of irritation. It cleans gently yet effectively. The distinctly orange smell is pleasant and not overpowering. It is naturally and delicately scented by bitter orange oil for a refreshing and soothing experience. 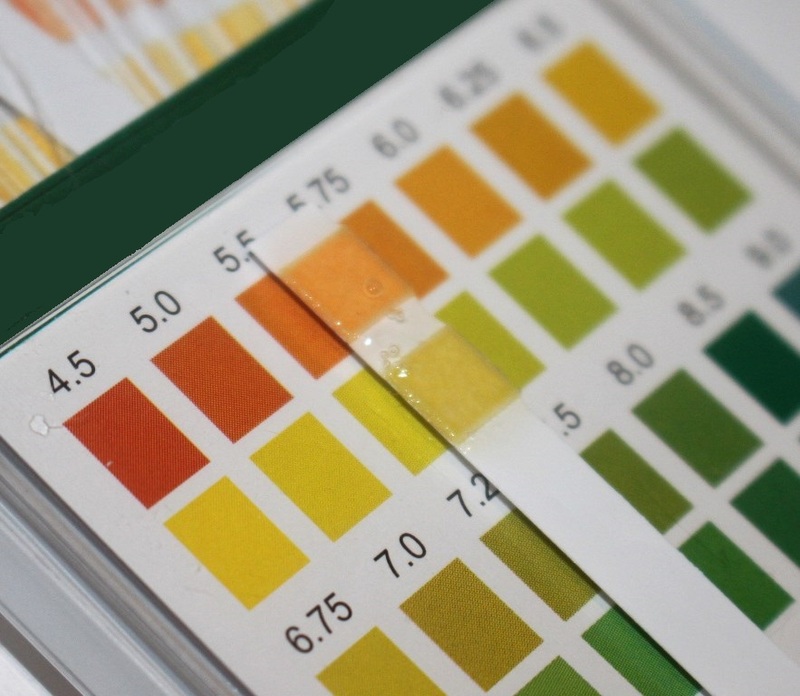 Not surprisingly, the product returns a favourable pH result, measuring approximately 5.6. Slightly acidic, it is near enough to ideal. 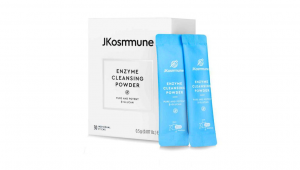 Its gentle yet effective cleanse assures it is suitable for all skin types, morning and night. 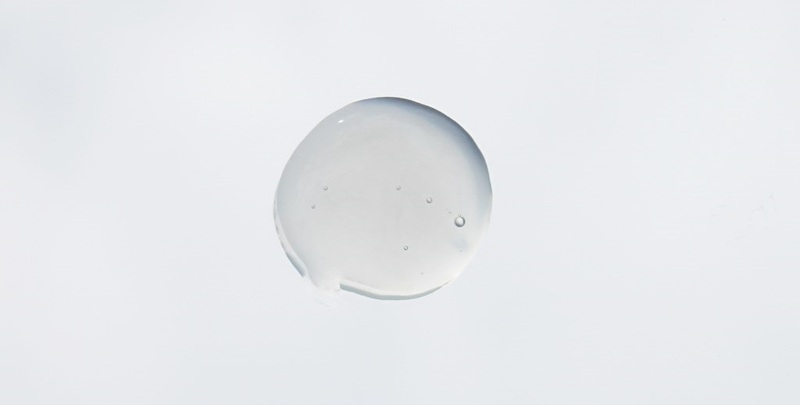 Unlike stay-on skincare, wash off cleansers mostly assist to fight ageing by preparing the skin for maximum absorption of the products that follow. 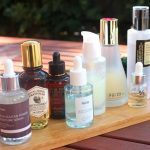 They basically prime your face to better receive the nutrients of serum, essence, ampoule, oil and moisturiser. Since skin becomes drier as we age, it is important that a cleanser function whilst also replenishing or at least retaining naturally diminishing moisture levels. Cleansers that dry skin can exacerbate the appearance of fine lines and wrinkles as they impair the moisture barrier. 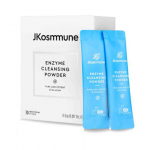 The positive effects of this cleanser ensure a good moisture balance is retained, helping to keep wrinkles at bay. The skin is well cleansed, refreshed and primed for the rest of the routine. I love this product. It has all the qualities I look for in a cleanser, delivered by a short, well considered ingredient list. It is reasonably priced, efficacious and gentle, making it suitable for all skin types. 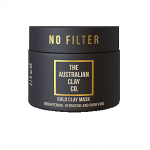 The fact that it uses only natural products to achieve this and is also Australian made, makes it a must-try product that earns my recommendation.